You will earn 964 Reward Points. Earn 1 reward point for every 1 dollar spent. 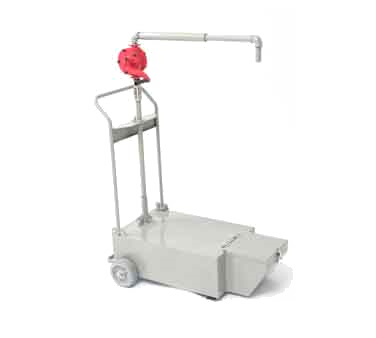 Specifically designed for safe and easy removal of waste oil from the kitchen Frymaster provides the answer for the transportation of waste oil from the kitchen to the disposal container, with shortening disposal units, available in 50-, and 100-lb. (25- and 50-liter) capacities. The low center of gravity provides stability when transporting or operating the unit. The heavy-duty manual pump is located at a convenient height, and is easy to operate. A one-way check valve allows for easy priming of the pump. There is no stooping, bending or lifting required to operate the unit. The oil tank has a tight-fitting cover and a secure latch to ensure safe transport without spills. Oil should be cooled to 120° F (49° C) or less for safe, trouble-free disposal.